. . . the watchword here is intelligence. One always feels with this artist that he has really thought in advance about what he is playing, that one is hearing the workings of an astute mind . . . Three cheers for Daniel Hope for making a high-profile Vivaldi release without recourse to "The Four Seasons" . . . the disc he has produced is surely a deeper way of signalling his love and understanding of the Red Priest . . . Hope and the Chamber Orchestra of Europe play them with the clarity and ensemble precision of a top-class Baroque orchestra, and with their spritely bowing and general avoidance of vibrato . . . There seems little doubt as to the kind of performances Hope has been influenced by, and the "Baroque" feel is enhanced by a generous and active continuo section which even runs to a harp and a lirone. What results is Vivaldi that is enjoyable and without quirks . . . guest soloist Anne Sofie von Otter catches the mood superbly. This is a disc made with love and intelligence -- a powerful combination. The instruments may be modern but Daniel Hope's second baroque recording with the Chamber Orchestra of Europe is as extravagantly decorated and pungent a performance of Vivaldi's concertos as any by Andrew Manze. Though the continuo line is fussily orchestrated in the Sonata "La Follia", you can't fault the dynamism. Add in a seductive performance of "Sovvente il sole" by Anne Sofie von Otter and Hope's . . . Vivaldi is strangely addictive.
. . . Hope and this orchestra never do the obvious. The Mendelssohn wasn¿t obvious -- apart from playing the piece from an unfamiliar edition, the musicians¿ lyrical gusto made the release unmissable. This Vivaldi release equally has freshness stamped all over it . . . his choice of concertos and instrumentalists, and the dancing lilt of his unfussy ornamentations, produce textures of unusual subtlety and variety. Hope, as they say, springs eternal. Apart from the soloist¿s panache, there¿s another key ingredient in the disc¿s charms: the diverse continuo group . . . Whatever the instruments, the sounds are airy, matching the lightweight pizzazz of Hope¿s violin and the compact COE forces . . . even in fury mode Hope¿s team never drive the music too hard, and in largo movements their graceful abilities sigh and wink in sync with the music. Nothing could be more intimate or delicate than the largo textures in RV 273, or more mysterious than the pause for thought in the middle of the sea-storm concerto, RV 253. And it¿s not just instrumental variety. There¿s a human voice too: Anne Sofie von Otter¿s mezzo-soprano. She glides with lissom gravity though an aria, with accompanying violin filigree, from a recently rediscovered serenata, Andromeda Liberata. Von Otter is a welcome presence . . . in this outstanding, kaleidoscopic collection. In the concertos Daniel Hope reveals himself as an ardent Vivaldian . . . Throughout his recital Hope puts thoughts and words into action with dynamic playing that pays more than lip-service to the example provided by historically informed performances . . . [von Otter]: Her performance, partnered by Hope's wistful violin playing, is beguiling. There is a percussive edge to it all, with the Chamber Orchestra of Europe bumping down on the beat with such determination that the whole thing begins to pulsate as if on a chemically induced rave . . . Von Otter singing 'Sovvente il sole' from Vivaldi's "Andromeda Liberata" is the undoubted highlight of this release. With sharply clipped articulation, intoxicating rhythmic verve (energized by occasional ornamental patterns), and a wide range of textural backlighting, they've given the whole thing [op. 5] an "extreme makeover" that still allows it to sound idiomatic, though in the sense of the term as we've been taught to understand it by dashing performances like this one . . . Enthusiastically recommended. Hope is clearly a musician of remarkable intelligence with a really winning way of talking about music . . .
Hauptdarsteller Daniel Hope umspinnt ihren [Anne Sofie von Otters] bronzefarbenen Mezzo mit feinen Figurationen . . . Schon die farbenfroh changierende Verstärkung des Continuo-Cembalos mit barocker Harfe, Gitarre und Orgel, mit Cello, Theorbe und (der freilich damals eigentlich schon ausrangierten Basslyra) Lirone lässt erkennen, dass Hope es ernst meint mit Vivaldi, und sein Spiel, sehnig-schlank, impulsiv und kleingliedrig, voller überraschender Hell-Dunkel-Kontraste, nicht besserwisserisch auftrumpfend, sondern von spontanen Launen getragen, nicht texthörig, sondern bei Gelegenheit mit Fantasie und Witz frei gestaltend, dieses Spiel hätte sicher auch in der Lagune dem alten Rotschopf gefallen und manches Mal zum Staunen und beifälligen Schmunzeln gebracht. Weil auch das von Konzertmeisterin Lorenza Borrani klanglich wie rhythmisch straff geführte Chamber Orchestra of Europe den Kapriolen Hopes flink zu folgen imstande ist, gibt es bei diesem Vivaldidebüt am Ende nur Gewinner. Alles geht . . . Das groovt . . . und der Funke fliegt durchaus. Das Konzert RV 234 gleich am Anfang der CD ist ein faszinierendes Stück, das im ersten Satz zündet wie eine Rakete. Hier wird deutlich, mit welcher instrumentalen Brillanz und Spielfreude Hope und das Chamber Orchestra of Europe musizieren, dynamisch und farblich äußerst differenziert, temperamentvoll, vital "auf der Stuhlkante" . . . Phrasenbildung, musikalische Rhetorik und Artikulation lassen erkennen, dass die Musiker ihre Aufgabe "historisch informiert" angehen . . . Besondere klangfarbliche Akzente setzt die Continuo-Gruppe. Sie ist mit Cembalo, Orgel, Lauten, Barockgitarre, Barockharfe und Lirone ungewöhnlich vielfältig besetzt. Besser, prächtiger, aufregender. Zusammen mit dem Chamber Orchestra of Europe tanzt [Daniel Hope] furios durch vier Violinkonzerte und eine Sonate Vivaldis und begleitet alsbald die Mezzosopranistin Anne Sofie von Otter gefühlvoll in einer Arie aus der Serenata "Andromeda Liberata".
. . . sein Spiel, sehnig-schlank, impulsiv und kleingliedrig, voller überraschender Hell-Dunkel-Kontraste, nicht besserwisserisch auftrumpfend, sondern von spontanen Launen getragen, nicht texthörig, sondern bei Gelegenheit mit Fantasie und Witz frei gestaltend, dieses Spiel hätte sicher auch in der Lagune dem alten Rotschopf gefallen und manches Mal zum Staunen und beifälligen Schmunzeln gebracht.
. . . der Geiger Daniel Hope hat . . . als Interpret Eigenes zu sagen. Sein rasantes Violinspiel rechtfertigt diese Aufnahme, die zudem als Beispiel für die gelungene Anwendung von Erkenntnissen der historischen Aufführungspraxis auf modernem Instrumentarium gelten darf. Das höchst engagiert begleitende Chamber Orchestra of Europe ist klein besetzt, entsprechend transparent und luftig fällt das Klangbild aus . . . In der Arie "Sovvente il sole" umschmeichelt die Solovioline den erdigen Mezzosopran von Anne Sofie von Otter. Das ist musikalische Stimmungsmalerei pur. Ohne dogmatische Scheuklappen werden hier einige der wirkungsvollsten Stücke Vivaldis aus der Sicht des 21. Jahrhunderts interpretiert. Daraus entsteht ein erfrischend freier Umgang mit den Tempi und Phrasierungen, wobei die Lust an impulsiven Klängen eindeutig überwiegt. L'assortiment de concertos débute par une "Inquietudine" pyrotechnique, où Hope fait valoir une ligne mélodique souple et élégante. Le Chamber Orchestra of Europe ponctue le discours, soutenant de manière dynamique et farouche le violoniste. Cette mise en bouche classieuse se confirme dans les ¿uvres suivantes, et révèle une touche hopienne reconnaissable à un mélange subtil d'épure et d'ostentation joyeuse voire naïve. Il y a une indicible netteté dans les transports de cet archet, un sens inné du croquis, des contours . . . Souverain et espiègle, dotée d'un chic débraillé très Régence, "La Follia" et ses 19 variations laisse admirer un continuo multicolore et foisonnant . . . La fameuse "Tempesta di Mare" est quant à elle brossée avec des touches fermes et vigoureuses et des articulations soignées qui démontrent -- si besoin était -- que le chef a intégré les enseignements du mouvement baroque . . . nous nous joignons à Anne-Sofie von Otter . . . pour saluer une lecture fine et aérée . . . Daniel Hope se convertisse entièrement aux instruments d'époque. Et si les baroqueux puristes ne se satisferont pas de cette vision solaire, trop mélodique, presque gorgée de sa beauté, les amateurs de Vivaldi plus tolérants sur l'instrumentarium pourront sans déconvenue se frotter à cet espoir qui porte si bien son nom. L'esprit en fête, les doigts en feu, l'artiste a décidé de se faire plaisir. "La Follia" ne manque donc jamais d'une stimulante énergie . . . il y a Anne Sofie von Otter, toujours aussi intelligente et stylée, dans un très bel air d'opéra avec violon obligé. Avec Daniel Hope, Vivaldi a droit à une nouvelle vie! Une vraie redécouverte . 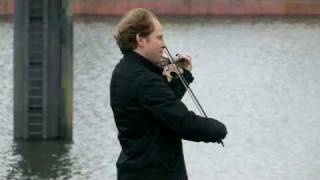 . .
Daniel Hope est un violoniste de talent . . . jouée avec une élégance tourbillonnante par Daniel Hope et ses partenaires . . . c¿est le sommet absolu de ce disque ! Anne Sofie von Otter fait encore une fois montre de ses talents multiples: clarté de la diction, émotion qui transparaît à chaque instant, musicalité sans cesse en éveil . . . L¿accompagnement est à la hauteur, à commencer par le violon de Daniel Hope, au bord de la rupture à chaque instant, dont le son plaintif (mais nullement larmoyant ou caricatural comme "savent" le faire certains) émeut de bout en bout . . . un disque qu¿il faut acquérir!
. . . un petit bijou de spontanéité et de musicalité, il aligne les concertos de Vivaldi avec un tempérament de feu. Cerise sur le gâteau, Anne Sofie von Otter dialogue avec lui dans un air extrait de l"Andromeda liberata". Vertigineux. Daniel Hope has many good reasons for the creation of this album, one being that as a teenager he often played the Concerto grosso in D minor, RV 565 with his mentor Yehudi Menuhin. Daniel spent much of his childhood in Menuhin's house (his mother was Menuhin's secretary, later his manager of 25 years), but it was only when he reached his teens that the great violinist recognised the boy's talent and invited Hope to perform together with him. Hope's most recent stimulus came from his collaboration with the Chamber Orchestra of Europe, with whom he has worked for several years, and with whom he recorded the Urtext version of Mendelssohn's Violin Concerto in his debut release for Deutsche Grammophon. Ever since childhood Hope has marvelled at Vivaldi's compositional virtuosity in his concertos. In this interview he explains why. What is the fascination of Vivaldi's music for you? Daniel Hope: Vivaldi's music has absolutely everything that you could want. It is an explosion of melody, of drama, of passion, of expression. It just takes hold of you and it doesn't let you go. You feel you're on a roller-coaster ride and yet there are moments of such poignancy, such beauty, such delicacy. The man was a poet: The Four Seasons are not just wonderful works of music, but also have inspiring poetry that is sometimes recited and connects the words to the music. There were very few composers that were able to illustrate music in the way that Vivaldi did, as he has done in the pieces that are on this album. There is an operatic quality to Vivaldi's expression; but his music also possesses a chamber-music quality and intimacy. He must have been the most extraordinary man and I think he would have been almost impossible to get along with. By all accounts he was incredibly arrogant and fun loving, and he knew exactly how to promote himself. He was arguably the most commercially savvy artist of his day, and was as famous as a rock star. Wherever he went, people adored him and his music. And yet he died penniless in Vienna, a broken man. What an incredible life! This is the first time that you have recorded Vivaldi. Why have you waited so long? DH: There is a great misconception that Vivaldi's music is easy to play, or that it's easy to put together. That's just not the case. His music is technically extremely challenging; from what we know, he was an amazing violinist who dazzled his listeners. There are reports of people writing to their friends after a concert that they'd never heard a violin sound like that, or that they'd never heard technical passages played quite so brilliantly. It is very difficult just to play the notes of some of his concertos! On top of that, there is a misconception that Vivaldi's music is sometimes shallow, perhaps because of the sheer volume of his output, but I really can't agree with that. For me, Vivaldi has great depth and it has taken me years of playing, thinking about, and living with his music before taking the important step of recording it. DH: This album is intended to show not only how wonderful Vivaldi is, but also that there is much more to his music than The Four Seasons. Now, I have nothing against The Four Seasons: I love them. They are amazing pieces, and I play them many times in a year and certainly wouldn't want to live without them. But there are also hundreds of other fantastic works which Vivaldi wrote, and by delving into these, one uncovers a whole new sound world. Some of his late concertos are far ahead of their time. They are so inspiring and have led me on a journey of discovery to find out more about this amazing man. I also wanted to show how the violin is represented in its different forms. One is the Baroque violin concerto where the violinist is the traditional soloist. But we have also recorded an extremely beautiful aria from one of Vivaldi's recently discovered operas where I accompany a great singer and friend, Anne Sofie von Otter, on the violin. Then there is La follia, which is an incredible dance with variations on a simple but moving theme. In fact La follia was so popular that it caused a sensation in Europe with the result that many composers took up the theme - Corelli was one, a few years before Vivaldi - and wrote their own variations. With La follia we have a piece for two violins and a continuo group. Here I was lucky to work with a young Italian violinist called Lorenza Borrani. She is an amazing virtuoso: it was as if we were almost duelling together when we were improvising passages. Who could play faster? Who could play slower? Who could play louder or softer? And who could improvise more spontaneously? Improvisation is sometimes forgotten about nowadays, but it was fundamental to Baroque music. It was required of every musician that he improvise on a number of passages and phrases in a piece. For example, a continuo cellist never just played the bass line as written. Any cellist who did so would have been regarded as very dull and unimaginative. The great cellists of the time used the written part merely as the starting point of their accompaniment. During the 19th century the long tradition of improvisation, however, came to an end. In this recording we attempted to return to this practice. And you have also recorded the wonderful La tempesta di mare . . .
DH: La tempesta di mare is the most amazing piece, in which Vivaldi shows how he was able to conjure up the elements of nature - in this case a storm at sea - through music using only a small group of string players and a violin. You have the feeling that you are in the middle of the sea that is very calm at the beginning, then has tumultuous waves with huge explosions of sound, and then returns to relative serenity. Vivaldi certainly knew how to expand the music and make people listen. For me, La tempesta di mare is one of his greatest works, as good as any of The Four Seasons. What are your feelings about historical performance practice? DH: There's a huge debate nowadays about historical performance, or authentic performance, or period performance (there are all sorts of words for it), and it's a particularly interesting as well as fiercely debated subject. What it basically means is that there is a movement that has existed since the 1960s, of musicians and scholars to research and perform works of classical music, ranging from Medieval to the Romantic era, in ways similar to how they may have been performed when they were originally written. Whilst most of our string instruments come from the 17th or 18th century, some elements of these instruments have been modified. One such example is the use of strings. If you are going to be “authentic" in your approach to Baroque music, you should use gut strings and a Baroque bow, and you should approach the sound and phrasing differently. However, this is only one part of the argument, which is far more complex than only using different strings. Over the past 40 years we have had the great fortune to learn an enormous amount about how music was played, or how we think it was played. For this recording we made a very conscious decision not to play on period instruments but to use “modern" instruments (again, many of these were actually built in Vivaldi's time), strings and bows; but at the same time, we tried to research, develop and integrate as much information as possible from the period-instrument movement. Roger Norrington once said something to me which I have never forgotten: “Historical performance (or historically informed performance, as he likes to call it) is in the mind and not in the hardware." For me, it's really about being historically informed, about what's possible, and then making a decision. In my case: to move on, but with all the glorious heritage of the past inside you. How did you conceive the basso continuo? DH: On the recording there is an extraordinary conglomeration of instruments that we call basso continuo or continuo group. The continuo not only provides the bass but much of the imagination inside the music. Often the continuo was only a harpsichord; this was certainly the case with modern performers over the last 50 or 60 years who were not acquainted with historical performance practice. But since then we've learned that a composer or performer would add many other instruments to create different effects. On this recording, therefore, we use not just the harpsichord played by Kristian Bezuidenhout, one of the finest keyboard specialists around today but a whole array of amazing instruments, some of which I'd never played with or even seen before! One is called the lirone, which very few players in this world know how to play. It's the strangest looking instrument - a cross between a cello, a double bass and a gamba, with many strings, and it produces a truly beautiful sound almost like an accordion. Its beautiful timbre blended wonderfully. We also have a Baroque guitar, and a Baroque harp. All these instruments go into the make up of the musical structure. Vivaldi's music is so rich: by putting these instruments here and there, it's a bit like adding salt and pepper to what's already a delicious meal. It just changes a phrasing or a colouring here and there. I am delighted that we had such wonderful Baroque specialists to provide us with a stunning continuo band. Es gab viele gute Gründe für Daniel Hope, dieses Album aufzunehmen. Er spielte oft das Concerto grosso d-moll RV 565 mit seinem Mentor Yehudi Menuhin, in dessen Haus er als Kind viel Zeit verbrachte (seine Mutter war Menuhins Sekretärin, später 25 Jahre lang seine Managerin). Aber erst als Hope Teenager war, erkannte Menuhin die Begabung des Jungen und lud ihn zum gemeinsamen Musizieren ein. In jüngster Zeit inspirierten Hope besonders die Projekte mit dem Chamber Orchestra of Europe, mit dem er schon mehrere Jahre zusammengearbeitet und die ursprüngliche Fassung von Mendelssohns Violinkonzert für seine erste Veröffentlichung bei Deutsche Grammophon aufgenommen hat. Seit seiner Kindheit bewundert Hope die kompositorische Virtuosität von Vivaldis Konzerten. In diesem Interview erklärt er, warum. Was fasziniert Sie so an Vivaldis Musik? Daniel Hope: Vivaldis Musik hat absolut alles, was man sich nur wünschen kann. Melodik, Dramatik, Leidenschaft und Ausdruck explodieren darin. Sie nimmt einen ganz gefangen und lässt einen nicht wieder los. Man fühlt sich wie in einer Achterbahn, und dann gibt es wieder Augenblicke von großer Intensität, Schönheit, Zartheit. Der Mann war ein Dichter: Die vier Jahreszeiten sind nicht nur wundervolle musikalische Werke, zu ihnen gehören auch inspirierende Gedichte, die manchmal rezitiert werden und eine Beziehung zwischen Worten und Musik schaffen. Nur wenige Komponisten konnten Musik so bildhaft machen, wie Vivaldi es tat und wie es in den Stücken dieses Albums zu hören ist. Vivaldis Ausdruck besitzt etwas Opernhaftes; zugleich hat seine Musik aber auch kammermusikalische Qualitäten und Intimität. Er muss ein außergewöhnlicher Mensch gewesen sein. Bestimmt war er sehr schwierig im Umgang. Nach allem, was man hört, war er unglaublich arrogant und vergnügungssüchtig, und verstand es sehr gut, sich ins rechte Licht zu rücken. Zweifellos war er der geschäftstüchtigste Künstler seiner Zeit und berühmt wie ein Rockstar. Wo immer er sich aufhielt, vergötterten die Menschen ihn und seine Musik. Und doch starb er völlig verarmt als gebrochener Mann in Wien. Welch ein unglaubliches Leben! Sie haben Vivaldi jetzt zum ersten Mal eingespielt. Warum haben Sie so lange gewartet? DH: Die Vorstellung, Vivaldis Musik sei leicht zu spielen oder zusammenzustellen, ist ein großer Irrtum. Das stimmt einfach nicht. Seine Musik ist technisch extrem schwierig; er soll ein hervorragender Geiger gewesen sein, der die Zuhörer in Erstaunen versetzte. Berichten zufolge haben Leute nach einem Konzert an Freunde geschrieben, dass sie einen derartigen Geigenklang und eine so brillante Ausführung technisch anspruchsvoller Passagen noch nie gehört hätten. In manchen seiner Konzerte ist es schon sehr schwierig, auch nur die richtigen Töne zu spielen! Ein Irrtum ist auch, dass Vivaldis Musik manchmal oberflächlich ist. Vielleicht ist seine enorme Produktivität schuld an diesem Urteil, aber ich bin da ganz anderer Meinung. Für mich hat Vivaldi große Tiefe. Ich habe jahrelang seine Musik gespielt, über sie nachgedacht und mit ihr gelebt, bevor ich den wichtigen Schritt machen konnte, sie auch aufzunehmen. Welches Konzept liegt dem Album zugrunde? DH: Das Album soll nicht nur zeigen, wie großartig Vivaldi ist, sondern auch, dass seine Musik viel mehr zu bieten hat als Die vier Jahreszeiten. Verstehen Sie mich recht, ich habe nichts gegen Die vier Jahreszeiten, ich liebe sie. Es sind faszinierende Stücke, ich spiele sie mehrmals im Jahr und möchte sie um keinen Preis missen. Aber es gibt auch Hunderte anderer phantastischer Werke aus Vivaldis Feder. Vertieft man sich in sie, kann man eine ganz neue Klangwelt entdecken. Einige seiner späten Konzerte sind ihrer Zeit weit voraus. Sie sind so inspirierend und haben mich angeregt, nachzuforschen und mehr über diesen erstaunlichen Menschen herauszufinden. Ich wollte auch zeigen, wie die Geige in ihren unterschiedlichen Funktionen vertreten ist. Da gibt es das barocke Violinkonzert, in dem der Geiger als traditioneller Solist auftritt. Wir haben aber auch eine wunderschöne Arie aus einer von Vivaldis neu entdeckten Opern aufgenommen. Dabei begleite ich eine große Sängerin und Freundin, Anne Sofie von Otter, auf der Geige. Dann haben wir La follia, einen hinreißenden Tanz mit Variationen über ein schlichtes, aber berührendes Thema. La follia war so beliebt, dass es ganz Europa begeisterte. Viele Komponisten haben eigene Variationen über dieses Thema geschrieben - beispielsweise Corelli, einige Jahre vor Vivaldi. Vivaldis La follia ist ein Stück für zwei Violinen und Continuo-Gruppe. Hier hatte ich das Glück, mit der jungen italienischen Geigerin Lorenza Borrani zusammenzuarbeiten, einer faszinierenden Virtuosin. Unsere improvisierten Passagen waren geradezu Duelle: Wer konnte schneller spielen? Wer langsamer? Wer konnte lauter oder leiser spielen? Und wer konnte spontaner improvisieren? Improvisation gerät heute manchmal in Vergessenheit, aber sie war grundlegend in der Barockmusik. Von den Musikern wurde erwartet, dass sie in jedem Stück über verschiedene Passagen und Phrasen improvisierten. Ein Continuo-Cellist beispielsweise spielte niemals nur die ausgeschriebene Basslinie. Sonst hätte er als sehr langweilig und phantasielos gegolten. Die großen Cellisten jener Zeit nutzten den schriftlich fixierten Part nur als Ausgangsbasis für ihre Begleitung. Im 19. Jahrhundert ging die lange Tradition der Improvisation jedoch zu Ende. In unserer Aufnahme haben wir versucht, zur alten Praxis zurückzukehren. Sie haben auch das herrliche La tempesta di mare aufgenommen . . .
DH: La tempesta di mare ist ein ganz unglaubliches Stück, in dem Vivaldi beweist, dass er die Naturgewalten - in diesem Fall einen Sturm auf dem Meer - mit einer kleinen Streichergruppe und Sologeige überzeugend darstellen konnte. Man hat das Gefühl, sich wirklich auf dem Meer zu befinden, das zunächst ruhig ist, dann von stürmischen Wellen mit gewaltigen Klangexplosionen beherrscht wird und schließlich zu relativer Ruhe zurückkehrt. Vivaldi verstand es ohne Zweifel, die Musik zu steigern und die Aufmerksamkeit der Zuhörer einzufordern. Ich halte La tempesta di mare für eines seiner größten Werke, das den Vier Jahreszeiten in nichts nachsteht. DH: Es gibt heute eine große Diskussion über die historische Aufführungspraxis oder authentische Aufführungen oder Originalklang - man hat alle möglichen Begriffe dafür -, und es ist ein ebenso interessantes wie umstrittenes Thema. Im Prinzip ist es so, dass vor allem seit den 1960er Jahren eine Bewegung von Musikern und Wissenschaftlern existiert, die sich der Erforschung der historischen Aufführungsbedingungen klassischer Musik vom Mittelalter bis zur Romantik widmet und Aufführungen anstrebt, wie sie vielleicht zur Zeit der Entstehung der jeweiligen Werke geklungen haben. Die meisten unserer Streichinstrumente stammen aus dem 17. und 18. Jahrhundert, aber einige Elemente dieser Instrumente erfuhren Veränderungen. Beispielsweise die Saiten. Wer Barockmusik »authentisch« spielen will, sollte Darmsaiten und einen Barockbogen verwenden und zudem anders intonieren und phrasieren. Das ist jedoch nur ein Aspekt in dieser komplexen Diskussion, die weit über die Verwendung bestimmter Saiten hinausgeht. In den letzten 40 Jahren haben wir unglaublich viel darüber gelernt, wie Musik - nach heutiger Ansicht - einst aufgeführt wurde. Bei dieser Aufnahme haben wir uns bewusst dafür entschieden, keine Originalinstrumente, sondern »moderne« Instrumente (von denen einige allerdings zu Vivaldis Zeit gebaut wurden), Saiten und Bögen zu verwenden. Gleichzeitig haben wir aber versucht, möglichst viele Erkenntnisse der historischen Aufführungspraxis zu sammeln und in unsere Arbeit einzubeziehen. Roger Norrington sagte mir einmal etwas, das ich nie vergessen habe: »Historische Aufführungspraxis [bzw. historisch informierte Aufführungspraxis, wie er es gern nennt] findet im Kopf statt, nicht in der Hardware.« Für mich geht es wirklich darum, historisch informiert zu sein über die Möglichkeiten und dann eine Entscheidung zu treffen. In meinem Fall: Vorwärts blicken, aber mit dem ganzen glorreichen Erbe der Vergangenheit, das man in sich trägt. Wie haben Sie den Basso continuo konzipiert? DH: In unserer Aufnahme gibt es eine außergewöhnliche Zusammenstellung von Instrumenten, die wir Basso continuo oder Continuo-Gruppe nennen. Der Continuo liefert nicht nur den Bass, sondern trägt auch insgesamt viel zum Klangbild bei. Oft war das Cembalo das einzige Continuo-Instrument; das galt sicher für moderne, mit der historischen Aufführungspraxis nicht vertraute Interpreten der letzten 50 oder 60 Jahre. Inzwischen wissen wir jedoch, dass ein Komponist oder Interpret viele weitere Instrumente hinzufügte, um unterschiedliche Wirkungen zu erreichen. Für diese Aufnahme haben wir daher nicht nur das Cembalo eingesetzt - gespielt von Kristian Bezuidenhout, einem der besten Cembalisten unserer Zeit -, sondern eine Vielzahl interessanter Instrumente. Einige hatte ich noch nie gesehen, geschweige denn mit ihnen zusammengespielt! Dazu gehört beispielsweise der Lirone, den nur wenige Musiker überhaupt spielen können. Das Instrument sieht höchst sonderbar aus (wie eine Kreuzung zwischen Cello, Kontrabass und Gambe), es hat viele Saiten und bringt einen wirklich wundervollen Klang hervor, fast wie ein Akkordeon. Sein schönes Timbre fügte sich hervorragend ein. Wir haben auch eine Barockgitarre und eine Barockharfe. All diese Instrumente sind Teil der musikalischen Struktur. Vivaldis Musik ist so reich: Wenn man hier und da diese Instrumente einsetzt, wirken sie wie Salz und Pfeffer in einem ohnehin köstlichen Mahl. Man verändert damit nur die Phrasierung oder Färbung an ein paar Stellen. Ich freue mich, dass uns so großartige Barockspezialisten zur Seite standen - so ist eine hinreißende Continuo-Gruppe entstanden. Daniel Hope a de nombreuses bonnes raisons d'avoir réalisé cet album, l'une d'elles étant que dans son adolescence il joua souvent le Concerto grosso en ré mineur, RV 565, avec son mentor Yehudi Menuhin. Daniel passa une grande partie de son enfance dans la maison de Menuhin (sa mère fut son secrétaire, et ensuite son manager pendant vingt-cinq ans), mais ce n'est qu'à son adolescence que le grand violoniste reconnut le talent du jeune homme et l'invita à jouer avec lui. La carrière de Hope a reçu son impulsion la plus récente de sa collaboration avec l'Orchestre de chambre d'Europe, avec qui il a travaillé pendant plusieurs années, et avec qui il a enregistré la version Urtext du Concerto pour violon de Mendelssohn en guise de premier disque chez Deutsche Grammophon. Depuis son enfance, Hope est émerveillé par la virtuosité compositionnelle de Vivaldi dans ses concertos. Dans cet entretien, il explique pourquoi. Qu'est-ce qui vous fascine dans la musique de Vivaldi? Daniel Hope: La musique de Vivaldi a absolument tout ce qu'on pourrait souhaiter. C'est une explosion de mélodie, de drame, de passion, d'expression. Elle s'empare de vous et ne vous lâche pas. On a l'impression d'être sur des montagnes russes, et pourtant il y a des moments d'une telle émotion, d'une telle beauté, d'une telle délicatesse. Cet homme était un poète: Les Quatre Saisons sont non seulement de merveilleuses œuvres musicales, mais elles comportent un poème exaltant qui est parfois récité et qui relie les mots à la musique. Très peu de compositeurs étaient capables d'illustrer la musique comme le faisait Vivaldi, et comme il l'a fait dans les œuvres réunies ici. L'expression de Vivaldi est proche de l'opéra; mais sa musique est également de caractère intime, dans l'esprit de la musique de chambre. Ce devait être un homme des plus extraordinaires, et je pense qu'il aurait été pratiquement impossible de s'entendre avec lui. Selon tous les témoignages, il était incroyablement arrogant et adorait s'amuser; il savait aussi très bien comment se promouvoir. Il était sans doute l'artiste de son époque qui avait le plus grand sens commercial, et il était aussi célèbre qu'une rock star. Partout où il allait, on adulait l'homme et sa musique. Et pourtant il mourut sans un sou à Vienne, brisé. Quelle vie incroyable! C'est la première fois que vous enregistrez Vivaldi. Pourquoi avoir attendu si longtemps? DH: On croit souvent à tort que la musique de Vivaldi est facile à jouer, ou qu'elle est facile à constituer un programme. Ce n'est tout simplement pas vrai. Sa musique est extrêmement difficile, d'un point de vue technique; d'après ce qu'on sait, il était un violoniste étonnant, qui éblouissait ses auditeurs. Certains d'entre eux, dans des lettres écrites à des amis après un concert, disent qu'ils n'ont jamais entendu un violon sonner ainsi, et qu'ils n'ont jamais entendu des passages techniques joués aussi brillamment. Il est très difficile de simplement jouer les notes dans certains de ses concertos! De plus, on pense à tort que la musique de Vivaldi est parfois superficielle, peut-être du simple fait de l'ampleur de son œuvre, mais je ne peux vraiment pas être d'accord avec cette idée. Pour moi, Vivaldi est d'une grande profondeur, et il m'a fallu jouer sa musique pendant des années, y penser, vivre avec elle avant de franchir le pas pour l'enregistrer. Quel est le concept de l'album? DH: Cet album est conçu pour montrer son seulement à quel point Vivaldi est merveilleux, mais aussi que sa musique est bien plus que Les Quatre Saisons. Je n'ai rien contre Les Quatre Saisons: je les adore. Ce sont des œuvres étonnantes; je les joue de nombreuses fois chaque année et je ne voudrais certainement pas vivre sans elles. Mais Vivaldi a aussi écrit des centaines d'autres œuvres fabuleuses, et, en s'y plongeant, on découvre tout un monde sonore nouveau. Certains de ses concertos tardifs sont bien en avance sur leur temps. Ils sont une source d'inspiration et m'ont conduit dans un voyage de découverte où j'en ai appris plus sur cet homme étonnant. Je voulais également montrer comment le violon est représenté dans ses différentes formes. L'une est le concerto baroque, où le violoniste est le soliste traditionnel. Mais nous avons également enregistré un très bel air de l'un des opéras récemment redécouverts de Vivaldi, où j'accompagne au violon une grande chanteuse et amie, Anne Sofie von Otter. Puis il y a La follia, qui est une incroyable danse avec variations sur un thème simple mais émouvant. La follia était un thème très apprécié, qui fit sensation en Europe, où beaucoup de compositeurs le reprirent - Corelli notamment, quelques années avant Vivaldi - et écrivirent leurs propres variations. Avec La follia, nous avons une pièce pour deux violons et un groupe de continuo. Ici, j'ai eu la chance de travailler avec une jeune violoniste italienne qui s'appelle Lorenza Borrani. C'est une virtuose stupéfiante: c'était presque comme si nous nous battions en duel lorsque nous improvisions des passages. Qui pourrait jouer plus vite? Qui pourrait jouer plus lentement? Qui pourrait jouer plus fort ou plus doucement? Et qui pourrait improviser plus spontanément? L'improvisation est parfois oubliée de nos jours, mais elle était fondamentale dans la musique baroque. Tout musicien baroque était tenu d'improviser un certain nombre de passages et de phrases dans une pièce. Ainsi, un violoncelliste de continuo ne jouait jamais la ligne de basse telle qu'elle était écrite, ce qui aurait été considéré comme un manque d'originalité et d'imagination. Les grands violoncellistes de l'époque utilisaient la partie écrite comme simple point de départ pour leur accompagnement. Au cours du XIXesiècle, la longue tradition de l'improvisation s'est néanmoins perdue. Dans cet enregistrement, nous avons tenté de renouer avec cette pratique. Et vous avez également enregistré la merveilleuse Tempesta di mare . . .
DH: La tempesta di mare est une œuvre des plus étonnantes, où Vivaldi montre qu'il était capable d'évoquer les éléments naturels - en l'occurrence une tempête en mer - à travers la musique en utilisant uniquement un petit groupe de cordes et un violon. On a le sentiment d'être au milieu d'une mer très calme au début, qui est ensuite agitée par des vagues tumultueuses, avec d'immenses explosions sonores, avant de revenir à une relative sérénité. Vivaldi savait incontestablement développer la musique et faire écouter. Pour moi, La tempesta di mare est l'une de ses plus grandes œuvres, du niveau des Quatre Saisons. Que pensez-vous des principes d'interprétation historique? DH: Il y a un immense débat de nos jours sur l'interprétation historique, ou l'interprétation authentique, ou l'interprétation d'époque (on utilise toute sorte de termes), et c'est un sujet intéressant qui suscite de féroces discussions. Depuis les années 1960, il y a en effet des musiciens et des musicologues qui se consacrent à la recherche sur le répertoire «classique», du Moyen-Age au romantisme, et à son interprétation, en essayant de se rapprocher de la manière dont cette musique était jouée au moment où elle fut composée. Si la plupart de nos instruments à cordes datent du XVIIe siècle ou du XVIIIe siècle, certains aspects de ces instruments ont été modifiés. Prenons les cordes, par exemple. Si l'on veut être «authentique» dans sa manière d'aborder la musique baroque, il faudrait utiliser des cordes en boyau et concevoir la sonorité et le phrasé différemment. Mais ce n'est cependant qu'une partie de la discussion, qui ne peut se résumer au seul emploi de cordes différentes. Au cours des quarante dernières années, nous avons eu la chance d'en apprendre énormément sur la manière dont la musique était jouée, ou sur la manière dont nous pensons qu'elle était jouée. Pour cet enregistrement, nous avons pris la décision très délibérée de ne pas jouer sur instruments d'époque, mais d'utiliser des instruments «modernes» (encore une fois, beaucoup d'entre eux ont en réalité été fabriqués à l'époque de Vivaldi), avec des cordes et des archets modernes; mais, dans le même temps, nous avons essayé de découvrir, de développer et d'intégrer autant d'informations que possible émanant du mouvement en faveur des instruments anciens. Roger Norrington m'a dit un jour quelque chose que je n'ai jamais oublié: «L'interprétation historique (ou l'interprétation historiquement fondée, comme il aime à dire) est dans l'esprit, et non dans les instruments». Pour moi, il s'agit vraiment d'être historiquement informé sur ce qui est possible, puis de prendre une décision. Dans mon cas: d'aller de l'avant, mais avec en moi tout le magnifique héritage du passé. Comment avez-vous conçu la basse continue? DH: Dans l'enregistrement, il y a un extraordinaire ensemble d'instruments que nous appelons basse continue ou groupe de continuo. Le continuo fait entendre non seulement la basse, mais une grande part de l'imagination que recèle la musique. Le continuo était souvent réduit à un clavecin; c'était certainement le cas avec les interprètes modernes des cinquante ou soixante dernières années qui ne connaissaient pas les usages historiques. Mais depuis lors nous avons appris que le compositeur ou l'interprète ajoutait bien d'autres instruments pour obtenir des effets différents. Dans cet enregistrement, nous employons donc non seulement le clavecin, joué par Kristian Bezuidenhout, l'un des meilleurs spécialistes du clavier actuels, mais tout un ensemble d'instruments étonnants, dont certains avec lesquels je n'avais jamais joué et que je n'avais jamais vus! L'un d'eux s'appelle le lirone, dont très peu de musiciens actuels savent jouer. C'est un instrument très étrange - un croisement entre un violoncelle, une contrebasse et une viole de gambe, avec de nombreuses cordes -, qui produit une très belle sonorité, presque comme un accordéon. Son beau timbre se fondait merveilleusement. Nous avons également une guitare baroque et une harpe baroque. Tous ces instruments participent à l'élaboration de la structure musicale. La musique de Vivaldi est si riche: mettre ces instruments ici et là, c'est un peu comme ajouter du sel et du poivre à un plat déjà délicieux. Cela change simplement le phrasé ou la couleur ici et là. Je suis ravi que nous ayons eu d'aussi merveilleux spécialistes du baroque pour former ce stupéfiant ensemble de continuo.